Remember the movie Up? They went to this national park. Located in the south of Venezuela, the Canaima National Park is a world class destination, with incredible landscapes, diverse flora and fauna, and a rich indigenous Pemón cultural history. The magic of Canaima includes the famous tepuys (table-top mountains); the rivers Orinoco, Carrao, Caroní, Paragua; and of course, Angel Falls – the world’s tallest waterfall at 1,002 meters (~3,287ft). Following is a quick introduction to this incredible national park, including what to do, how to get there, and what to pack. Canaima has a great combination of nature adventures, cultural exchange, and authentic Venezuelan cuisine. 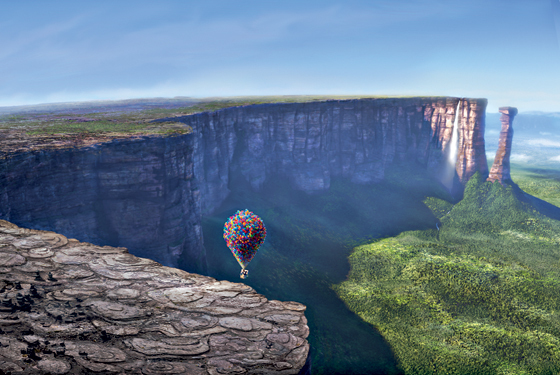 The main places to visit are : Angels Falls, Roraima, and the Guri Dam. Angel Falls is one of the world’s greatest natural wonders, with a fall of more than 1,000 meters (~3287ft). The journey leading up to the falls is also an adventure, with the route passing through other special places like the Lagoon of Canaima, Frog Falls, the Carrao river (which you navigate in curiaras, traditional canoes). The best way to do this is with a local Pemón guide, who can introduce you to their cultural and historical connection with nature. Seeing Angel Falls at its best is all about the balance between enough rain and not too much. The best months to visit are October and November. High seasons are between July and August, and October and January – during these times, prices may increase. August and September are the rainiest months, which means you risk poor visibility and trip cancellations due to security concerns. If your trip is canceled because of rain, you can typically do an alternative trip to Orquiídea or Pozo de la Felicidad (“The Well of Happiness”). Tepuys are famous steep rocky plateaus with vertical walls and flat tops, the most famous of which is Roraima tepuy, with more than 2,800 meters (~9,186ft). Roraiman represents the sacred territory of the indigenous community of the Pemón. This magical and mysterious place is one of the most amazing trekking routes in the world. During the climb to the summit, you can enjoy the diverse flora and fauna and stunning scenery. On top of this space is a triple border of Brazil, Venezuela, and Guyana. Simon Bolivar Hydroelectric central, also called Guri Dam, is located 100 kilometers (~62 miles) from the Orinoco River. This engineering work has a production capacity of 10 million kilowatts per hour, which makes it the third largest hydroelectric plant in the world. Here you can see a concrete dam with a length of 1,500 meters (~4,921ft) and a height of 180 meters(~590ft). To put in perspective, that’s almost four times the length of the Hoover Dam! On a visit to the dam, one can enjoy El Delta Solar of Alejandro Otero, as well as the square of the sun and moon and magical gardens, aka the Landscape of the Guri. Because there is no route of infrastructure that gets into Canaima National Park the easiest way to get to there is with a local guide, ideally a member of the Pemón community. There are no direct flights from Caracas to Canaima – you must first travel to Ciudad Bolivar or Puerto Ordaz. Some recommended airlines from Caracas are: Aeropostal (tel 0800/284-6637; www.aeropostal.com), Aserca (tel 0800/648 8356; www.asercaairlines.com) and Rutaca (tel 0800/788-2221; www.rutaca.com.ve). It’s worth mentioning that Insel Air (+297 582 1200; www.fly-inselair.com/es/) is the only international ariline that operates flights from Curacao to Puerto Ordaz. Most tour packages to Canaima include meals, which generally consist of arepas, fish, cassava, and other foods typical of the area. You may also receive exotic Pemón foods like soup Tuma, termites sauce, starch, and others. Plastic bags for bathroom time. Some services include porters to take charge of carrying your luggage. Note! Please do not write your name on any of the stones or trees in the park – this is a sacred place for the pemón and should be treated with respect. With some of the most spectacular natural beauty, fascinating indigenous culture, and the tallest waterfall in the world, Canaima National Park can be the trip of a lifetime. We hope this post helps you plan your trip there, and feel free to email us at any point at jack@keteka.com if you would like more travel tips. And who knows, maybe some day someone will make an animated film about your adventure!